Do you know what a group of bunnies is called? A fluffle. Doesn’t that fact automatically improve your morning? Unfortunately, bunnies have nothing to do with today’s post; however, this post will nonetheless be entertaining, informative, and concise—which likely can’t be said about the rest of your day. Continuing from last week’s post, we’re going to talk about vision. For how could you ever spot a fluffle if you couldn’t see one? As you may well know, not everyone sees the world in the same shades of green—literally; that’s not even a saying—for as a fact, about 1% of women and 10% of men are color deficient (I’ll explain this discrepancy later). Now, note how I didn’t say color blind—true color blindness would be a complete absence of color (called achromatopsia) and is exceedingly rare. 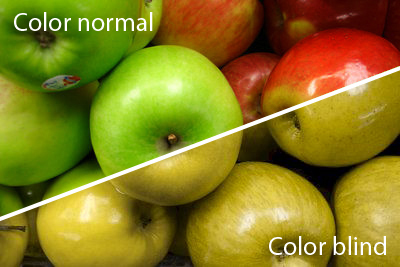 A color deficiency, however, is what people mean when they say someone is color blind. The cones in your eyes, that is, the color-discerning photoreceptors (what? you didn’t know this? go read last week’s post; I’ll wait for you), come in three types: red-sensitive, green-sensitive, and blue-sensitive, each of these working together to produce the spectrum of colors we see daily. For comparison, dogs only have two types of cones: blue-sensitive and green-sensitive. So even though the common misconception is that dogs don’t see colors, they do—but only in shades of blue and green (a good tip: if your dog’s toy is red, it will be hard for him/her to distinguish it from the surrounding environment, especially if that environment is green). As humans, most of us have a fully functioning third, red-sensitive cone. And even though the addition of just one cone doesn’t seem like much, it is hugely important—it increases our color vision by 900%! A photopigment on its own, can detect about a hundred different shades of color. So whereas dogs can see about 10,000 shades between blue and green (100 x 100), we can see about 100,000 shades (100 x 100 x 100). In addition to red’s own 100 shades, it can now “mix” with blue and green to have a multiplicative effect (e.g. blue and red makes purple; yellow and red makes orange). But wait: it gets even cooler. The genes that produce these red/green/blue-sensitive photopigments are carried on the X chromosome; thus, women (with two X chromosomes) are less likely than men to suffer from color deficiency, because if a color-producing gene gets damaged, they have an extra chromosome that can replace it. Or in some instances, produce a new photopigment that 99% of the world doesn’t possess. In very rare instances, women may have a fourth photopigment (making them a tetrachromat compared to us regular trichromats) that allows them to see colors we can’t even imagine. For example, one interview with a functioning tetrachromat revealed that she sees something like a “red haze” around clouds against a blue sky. 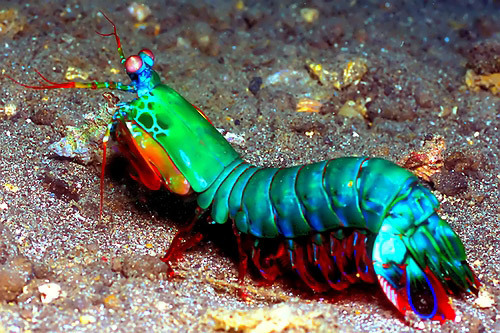 The mantis shrimp (pictured right) sees the world with sixteen different photopigments. I wonder, as I often do on many things, if tetrachromats see so acute, that it not only effects color perception, but it may also might affect other senses. For instances, can they “see” fruit that is more ripe than other selections, can they see an aura around people/places/objects, to define if they are good or evil (Buddhist monks say they can), by staring at someone over a prolonged time can they “see” if that individual is lying or not. Have scientists done studies, where they have examined individuals with elevated (5) senses, and how those heightened senses might affect the rest of their mannerisms/perceptions/senses? Rhetorical question, but interesting none the less. Although you said your question was rhetorical, I think it is a remarkably provocative one–if not as a scientific inquiry, certainly as fodder for a science fiction piece. Related to this topic, however, there is work being done at research labs where they take one of these photopigments that monkeys lack (the same one dogs lack), attach it to a virus, inject it into a monkey, and the monkey gains the ability to see as we do! In fact, these researchers are confident that they could do the same treatment to humans with no harm–correcting the color deficiency of those with it, and IMPROVING the color recognition of already “normal” people. However, because the FDA still hasn’t cleared it (or whatever advancement-clogging bureaucracy it is) they haven’t been able to introduce it to the general public. But when they do, we’ll be able to test your theory for real!